(ARA) - Many people will be traveling this holiday season to visit family and friends and will bring their expensive laptops along on the trip. Most of these travelers will not have considered that thousands of laptops are stolen from airports every week. Thieves are ready to capitalize on the increase in air travel during the holidays and the chaos of the holiday season. At airports alone, 12,000 laptops a week are lost according to a survey by the Ponemon Institute. And, that number is sure to increase this season. While the loss of an expensive laptop can dampen the holiday spirit, the potential for identity theft will hang over the victim’s head well into the New Year. Credit card, Social Security and bank account numbers are just some of the pieces of sensitive information that can be lifted from a stolen computer. 1. While traveling, back up your data as frequently as possible to minimize the risk of data loss in the event that your laptop is stolen. Use an encrypted thumb drive to back up sensitive files. The information stored on the computer is often more valuable than the computer itself. 3. Keep your technical gear with you. Checking your tech gear with your luggage is a big gamble. Apart from not having your valuable and expensive gear under your control, baggage handlers don’t know what is in your bag. 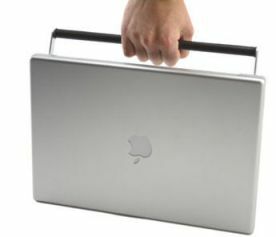 Laptops especially should always be carried in nondescript carrying cases, such as backpacks or tote bags, instead of tell-tale laptop bags. And, if you have to keep your laptop in your car, put it in the trunk before you arrive at your destination. 4. Clearly label your laptop to distinguish it from others at security checkpoints. Make sure to put your name, contact information and address on the label, as most airport lost-and-founds won’t power up the computer to find out whom it belongs to. 5. Ask to put your laptop and technical gear in the hotel safe when you’re not using it. When making a reservation, ask whether the hotel offers this service. If they do not, stow your laptop in a secure cabinet in the room. 6. If you are using a public computer, be aware of keyboard loggers/trackers. Identity thieves will often install keyboard loggers on to public computers (like those in hotels or public libraries). These programs invisibly track the keystrokes of unsuspecting victims. 7. Do not log on to unsecured wireless networks. If the wireless network you’re logging on to doesn’t require you to enter a password, don’t log on to it. 8. Avoid accessing financial or banking records while traveling, especially on public wireless networks. This will help prevent your bank records and financial information from winding up in the wrong hands. 9. Clicking “remember me” on Web sites, or allowing the Internet browser to remember passwords or usernames, negates the security those username and passwords offer. If a thief gets a hold of your computer, they will have the ability to easily steal your online (and possibly offline) identity. 10. Clear your history and cache after using a Web browser. Web browsers remember everything about your session even after you’ve logged off.